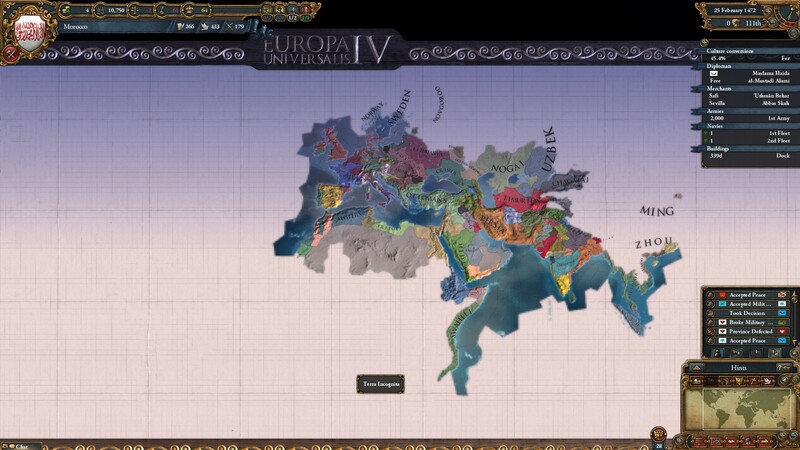 I never thought I would find myself yearning to play more Europa Universalis but when I realise that I haven’t played it for a few weeks I find myself itching to get back to it. An Editor’s note here: this Verdict has been waiting to be published since before the Eurogamer Expo, trade shows are time-sinks just as much as Europa is. I’ve tried my hand at various grand strategy titles from Paradox over recent years, Hearts of Iron, Crusader Kings II and Victoria have all found themselves loaded up, only to be discarded soon after. With Paradox’s titles, due to their complexities, I often find myself starting a game with a small, out of the way country or province. All well and good but you don’t really get to achieve much without getting your head stomped in or finding that the country you are playing as can’t do anything at all because it is just too small. What did I do with EU IV then on my first attempt? 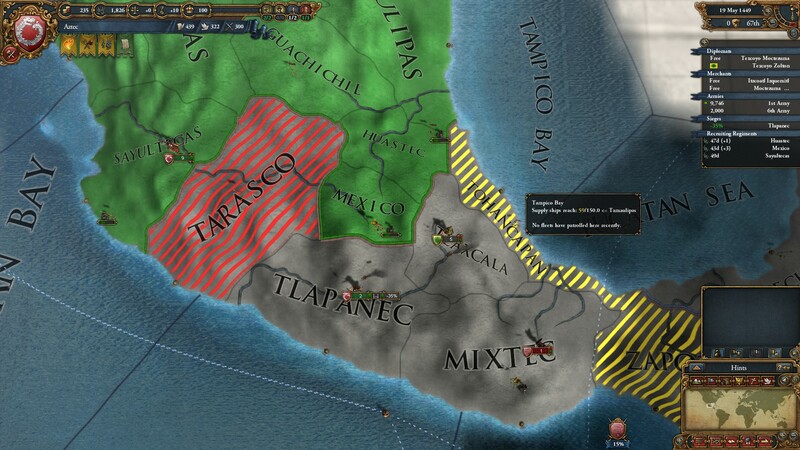 I tried my hand as the Aztec’s and pretty quickly found myself at war with my Central American cousins. After winning a few battles, I ended up in massive debt, a country fractured by peasants rebelling against my poor leadership and massive, never ending levels of war tax. It was proving to be great fun, even if I wasn’t able to develop any technologies which would help me in my fight for supremacy as I was spending all my Monarch Points on keeping the rebels quiet. I knew things were doomed though and tried my hand with a new game as a Native American tribe…which had similar consequences to my Aztec adventures. I decided that playing in the New World wasn’t really working out too well so I turned my eyes back to Europe and an Irish province. Here, totally ignoring the fact that the game lasts for around 300 years, I decided to get stuck in and kick up a fuss with my Irish brethren after setting myself the Mission (with a reward of much Prestige) of uniting Ireland and kicking the English off our land. It turned out that launching a non-stop series of battles wasn’t the best idea as, you guessed it, rebels soon appeared and my finances were ruined. Singleplayer then, despite three complete failures had proven to be extremely fun and much easier to get into than any other Paradox title I had previously played. It was during a bit of a lull in proceedings that Craig Lager of Gaming Daily messaged me on Steam suggesting we play a game together. Cue some frantic scrambling for my mic, an update or two to Skype and I was on my way. My lands were being diced up by my rivals. While playing by myself was perfectly enjoyable, things really kicked up a gear when we went online. Craig chose Portugal while I took on Morocco. I was a Muslim state which meant that any improvements to Administrative, Diplomatic or Military technologies took 50% more Monarch Points to upgrade compared to Craig in the modern, westernised Portugal. 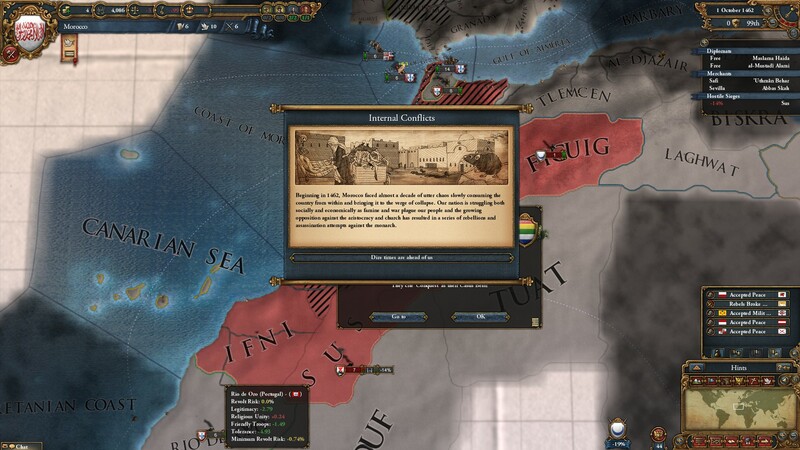 I didn’t think anything of this, and having set my National Mission to conquer a province belonging to Algiers I set about building an army to try and take back what was rightfully mine. Craig meanwhile was busy investing in explorers and defending his trade routes while I set my forces forth. Battles play out without any direct involvement, if two opposing armies land in the same province they automatically fight with the victor depending on the attributes of the forces involved in the battle and any military leader that might be attached to the unit. 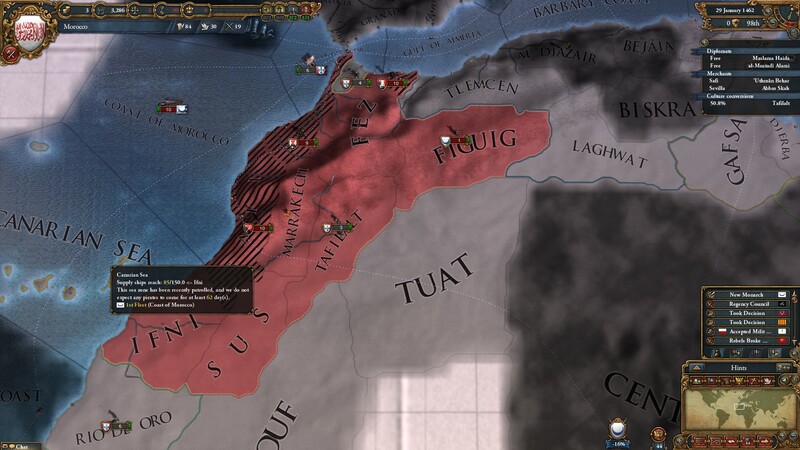 As I went to war while allied to Tunisia to the east of Algiers I thought things would go well, however after laying siege to my target province, and Tunisia getting royally stomped I came face-to-face with an Algerian army the same size as mine. Just one that was more skilled than mine as my troops quickly buckled and retreated. A suing for peace things were all good..apart from my ruined relationship with Algiers. Things progressed quietly for a while as I built up my forces and tried another assault on Algiers. I was making progress having won one siege and was making moves on two other provinces. Algiers tried to sue for peace, but in my cocky way I was having none of it. My mistake, they soon enough came back with a massive force pushing my units back and rapidly conquering some of my land until I was able to reach a peace agreement setting things back to before the war. Just a small portion of the map. It is massive. However, my reckless warmongering and loss of Prestige and Stability in the war had led to rebels rising up in my provinces and ever more loans from the banks. I was ruined financially with my government having no support from the people. I was fortunately able to reset everything with a new leader, no more loans but a very precarious position. Craig meanwhile had been busy sending his explorers and colonists here, there and everywhere having managed to take over a territory on my southern border. He was having the time of his life, but swore to defend my honour in a future war with Algiers. Thanks to my fractious relationship with my neighbour war wasn’t far away. We were doomed from the start, even Craig’s superior numbers weren’t able to knock back the troops from Algiers and we decided to make a hasty withdrawal from the conflict. Craig was lucky enough to pull out without any further doom, I meanwhile had to surrender half my land to Algiers leaving me once again utterly bankrupt and with a distrustful populace. I reasoned that peace was the way forward, I sent emissaries to improve relations with Algiers while I slowly built up enough Administrative and Diplomatic power to actually improve on my technology levels. Things were going well…until France decided to invade Spain who called Craig to assist. France at this point were dominating the smaller nations within the modern French borders and quickly rolled through half of Spain and were getting very close to Portuguese land. My adventures in the New World were a failure as well. I was in no fit state to help out, I was just hoping that Algiers would look kindly on my past indiscretions and not act on the false claims they had fabricated on my land. Hope was short lived as a couple of large armies rolled into my territory with Craig’s limited forces in their sole North African province unable to cope. We were swamped and both knew that the end was nigh. We called it quits on that game. We weren’t put off though, after a brief flurry as I took control of Sweden and Craig Castille (Spain), we both found ourselves in positions we had no chances of winning. That game was quickly scrapped to be replaced by Craig’s return to Castille and the start of my adventures in Ming, a massive Chinese nation. This is a game which, despite the immense complexities, offers so much reward if you devote just a fraction of time required to get to grips with it in it. Playing online? Some of the best gaming moments I’ve had all year. Don’t be scared, read some Wiki guides, watch some YouTube videos and get playing with some friends. You won’t be disappointed. Please check this post for details on our scoring system. Review based on PR supplied Steam copy.